Campus Crusade for Christ (known as Cru in the United States) is the parent ministry of The Cru Foundation. Cru exists to fulfill the Great Commission through the power of the Holy Spirit by winning people to faith in Jesus Christ. They focus on creating spiritual movements that build up disciples and send them out to bring others to Christ. Cru’s vision is for everyone in the world to know someone who is truly living out new life in Jesus. Cru was founded in 1951 by Bill and Vonette Bright. This ministry, which began on the UCLA campus in Southern California, is now active in 191 countries. Visit Cru’s website to learn more. 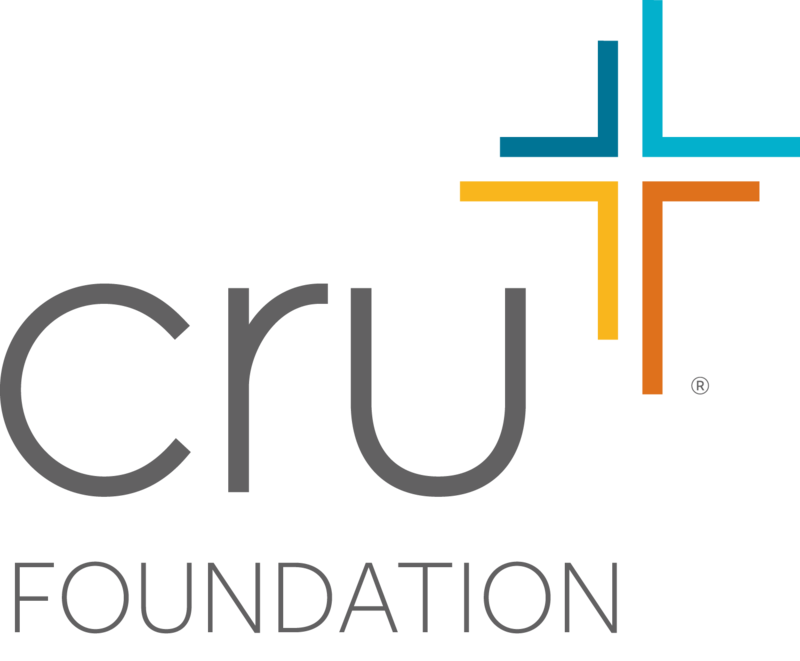 The Cru Foundation is a ministry of Cru. Donors to The Cru Foundation can be confident that their confidential information will not be shared with anyone outside of the Foundation. We run our day-to-day operations independent from Cru. Cru shares the Gospel through a family of ministries. Some of the most notable are The JESUS Film Project, Josh McDowell Ministry, Campus Ministry, FamilyLife and Athletes in Action. We work closely with many of the other ministries in the Cru family. Discover what making an eternal impact looks like — not just in theory, but practically lived out! Through this inspiring collection of true stories, you’ll be encouraged and empowered to maximize your impact for the gospel ... simply by being generous! Not only will your investment in the gospel expand God’s Kingdom — it may also provide tax benefits and income for you and your family! 1. When and how did you first learn about Cru® (formerly known as Campus Crusade for Christ)? 2. Why did you first give to Cru? I have a passion for evangelism. I have a passion for ministry to college students. I have a passion for international missions. I have a passion for ministry to the poor. I have a passion for the Great Commission. God has blessed me, and I want to give back. I want to invest my God-given resources wisely. I believe that giving to Cru is a good example of biblical stewardship. Giving to Cru is an expression of my Christian faith. I know Cru uses my gifts prudently. I am personally involved with Cru as a volunteer. I currently work for or am retired from Cru. I give through the mail. I give electronically or online. I give at special events. I give through my connection with a Cru staff member. I give to Cru through my church. I support Cru regularly in prayer. I am a Cru volunteer. I have named Cru as a beneficiary on my life insurance or retirement plan. I have a lifetime income agreement (e.g., a charitable gift annuity) with Cru. I am making a gift to Cru through my will. I appreciate knowing that the ministry I believe in will be there to help others through my stewardship and gift planning. I want to set an example for those closest to me that giving to ministry is an important value that defines our family. As an act of love, I want to please my Father in Heaven by being generous. I appreciate being able to support ministry while benefiting through tax savings. I personally feel better knowing that I have made a difference. Passing my values to the next generation. Including Cru in my will or trust. I have already included Cru in my will or trust. Naming Cru as a beneficiary on my life insurance or retirement plan. I do not currently have an up-to-date will or trust. I’ve never really thought about leaving a gift in my will or trust to Cru. Honoring the memory of a loved one, staff person, or someone who greatly impacted my life through a gift to Cru in my will. 9. How confident are you that your will or estate plan will truly accomplish your wishes? 10. In what year did you last review your will or overall estate plan? My estate plan is more than 5 years old. I'm not sure my will minimizes the potential for family conflicts. I don't know how changes in the tax law effect my plan. I don’t know who will be making important decisions about my children, my healthcare, or my finances when I am no longer able. I’m not sure my will accomplishes what I want. A major life event (a move, birth, death, divorce, health crisis) has occurred. I am passing down to my heirs a retirement account that may leave them with a large IRD (income in respect to a descendant) tax bill. I might be interested if I knew more about it. I am confident in my current plan. I would be uncomfortable with a phone call from someone I don’t know. I don’t think I have enough assets. 12. Which of the following topics might help you be more effective as a steward? 13. In what ways could Cru and The Cru Foundation assist you in growing in the grace of giving? Would you like to receive a free copy of The Cru Foundation’s Estate Planning Guide? The Cru Foundation is committed to guiding you through good stewardship and your charitable giving options. Would you like to receive a call from one of our Stewardship Counselors?